This entry was posted in Finished project, Gifts, Giveaway, Quilting and tagged baby quilt, fat quarter, gift, giveaway, hand sewn binding, Kate Spain, Moda fabrics, quilting, Sunnyside. Hey, I love your quilt and I’d love to be entered into your giveaway too! Your friend is very lucky, and i hope the quilt will be a family heirloom that they’ll cherish for years and years. Thank you! I’m sure the quilt will be used often, they loved it. Well I still want to say “hey I love your quilt” because I do! I bought a Janome with quilting attachments and I have been practicing with the attachments – I actually have a walking foot and know how to use it! So far I have made a few sets of placemats with various patterns for myself and family. But I still can’t believe some of the quilting projects I see here. Just beautiful! Thank you! I love the playing with fabric and colour part of quilting most. You’re not ready yet to tackle a full sized quilt? I want to enter! 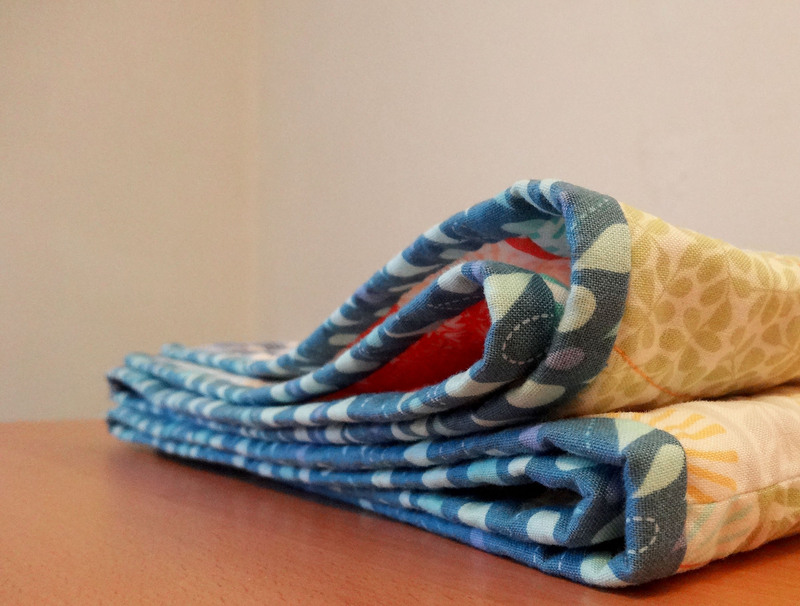 I know at least two babies on the way who will need a quilt, and I love this fabric range. Geachte Emmely’s vriendje, kies dan alsjeblieft mijn naam! Haha, I’ll pass on the message. I’m afraid he’s terribly objective though. I’l probably end up holding a bowl with names under his nose while he picks a piece of paper without taking the time to look up from his newspaper. I also want to say I love the quilt, and in particular, I love your solution for the backing. It’s awesome! It gives me some ideas for a project that’s in my future. Thank you! And it’s perfectly allright not to enter. Not everybody quilts or will like this fabric. 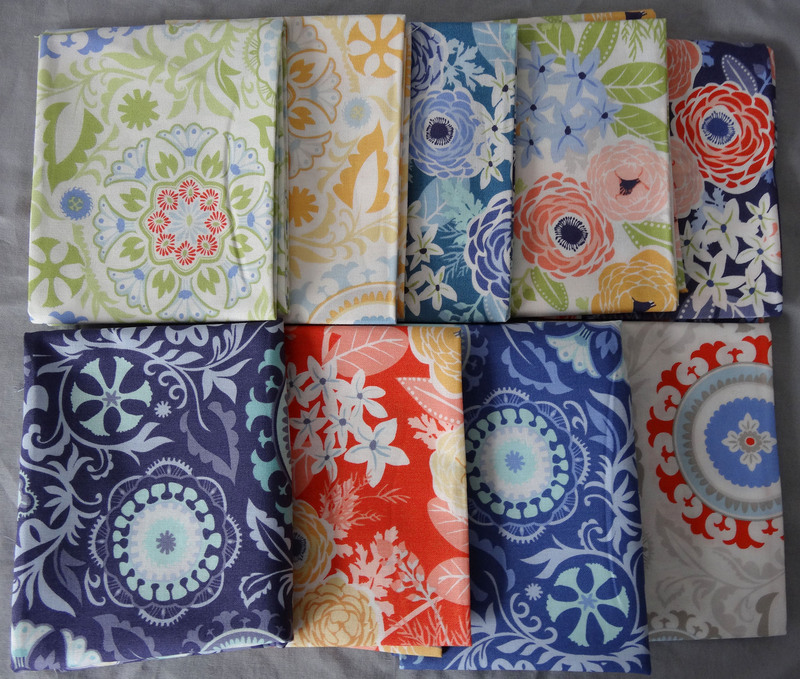 I would love to win some of your quilt fabric! So far I am not really familiar with quilting, but it would also look nice pieced together in a skirt. You really inspired me btw with your jeans skirt, got all my old jeans and a piece of jeans fabric with a nice applique/edge ready to go. For a summerskirt I think this fabric would work. I would probably line it though. Yay for cutting up old jeans and turning them into other garments! I think a stolpplooi is called a boxpleat. I was just ging back here to say it is indeed a boxpleat, but I see you already knew that! When you have a picture of the finished skirt I’d love to see it! I am really loving the two-sided quilt movement. So yes, I would like to win this fabric, and I would use it for the back of a quilt where the front will be made using a Sunnyside jelly roll which is sitting patiently on my shelf. I think you could have made a scrappy binding for the quilt too. Sounds like a good plan! I did consider a scrappy binding but thought it might end up a bit too busy. It looks great. I don’t think the backside is actually a backside, the quilt has two front sides! Do you do your quilting on a regular machine? When searching on what a walking foot is (turns out my sewing machine already has a grippy upper feet dog, now I understand why that’s useful) I found a video on “How to Quilt a Big Quilt on a Standard Sewing Machine”. Seems like a lot of work. Yes, I quilt on my regular sewing machine. It came with an extension table (see picture on my About page) that makes it easier to manoeuver large projects. I also use my walking foot for knitfabrics and slippery fabrics. This quilt is about as large as I make them because I don’t want the quilting to become a struggle. How much quilting you need to do to hold the 3 layers nicely together depends on the kind of batting that you use. Some battings need very dense quilting others can easily be quilted with lines up to 8 inches (20cm) apart. Less quilting is also less work. The quilting of this quilt was very doable. I’d like to be included in the giveaway, please. Now, to more important matters–the quilt turned out great! 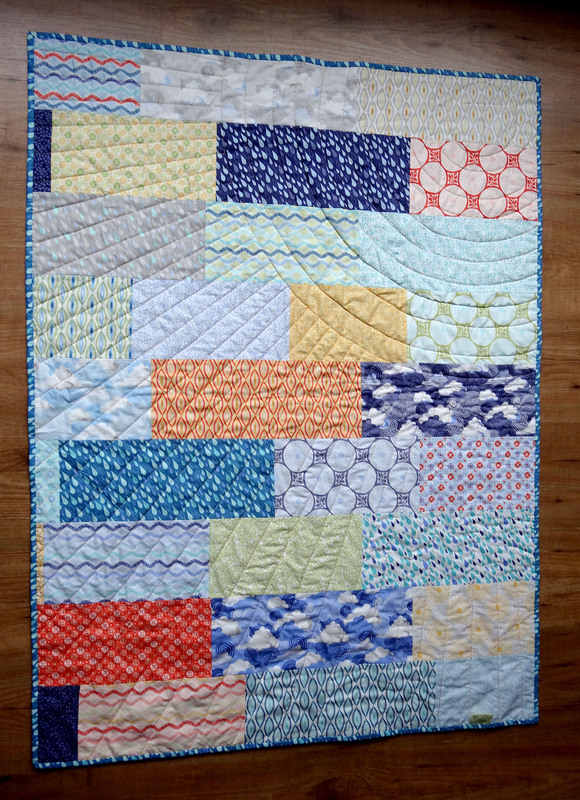 I really like the quilting pattern–a great idea for a happy quilt! Thank you. 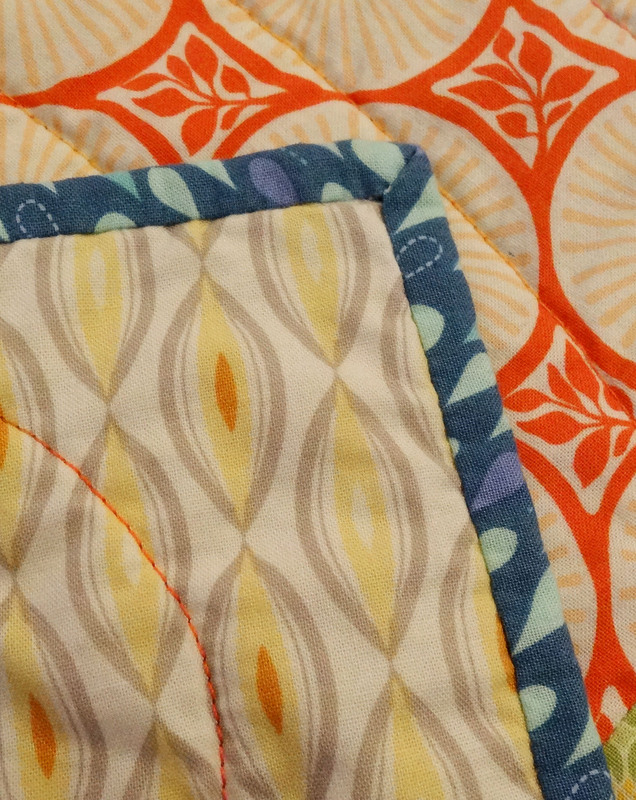 I try to pick quilting designs that enhance the quilt and I think that worked out very nicely in this case. Your quilting design on this is so clever. I love the sun. Just found your blog via a comment you left on mine! 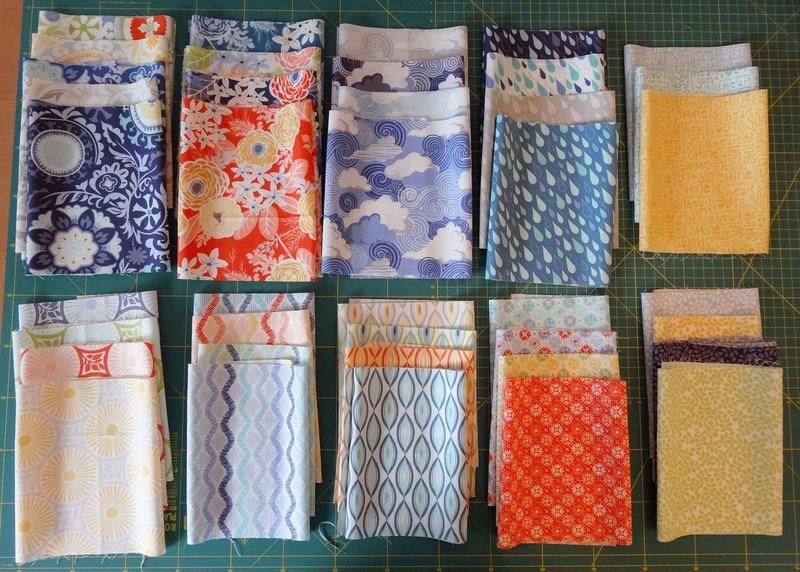 Love the “no seam matching” idea – will be great for charity quilts. I love the fabric and would like to be entered into the giveaway. Yes, no seam matching really speeds up the piecing. Otherwise I get in my “it must be perfect every single time!” mode and that’s not very helpful when a project has a deadline in the somewhat near future. If you start simple and look up some YouTube videos on piecing and quilting a quilt is not that difficult to make. not so lang ago (in december) I produced a quilt for my former university collegue because she would get a little boy in january. Now the boy was born on the 8. of january and he looks really cute with his quilt. Unfortunately I did not have the opportunity to get such lovely fabrics. I used common cotton wool fabric without any design and sew some animals for the quilt. It looked surprisingly good for my first quilt. But I wished I had such a lovely collection of fabric. Now I planned a quilt for my daughters bed. She is 5 now and your flower fabrics would fit there very good. It would get such a lovely simple quilt just as you sew yours. It is really great. I love your quilt and I ‘d like to enter the giveaway. I#ve not yet quilted before, but aways wanted to try. Thank you! If you have the money for a walking foot and there is one available for your machine it is absolutely worth it. 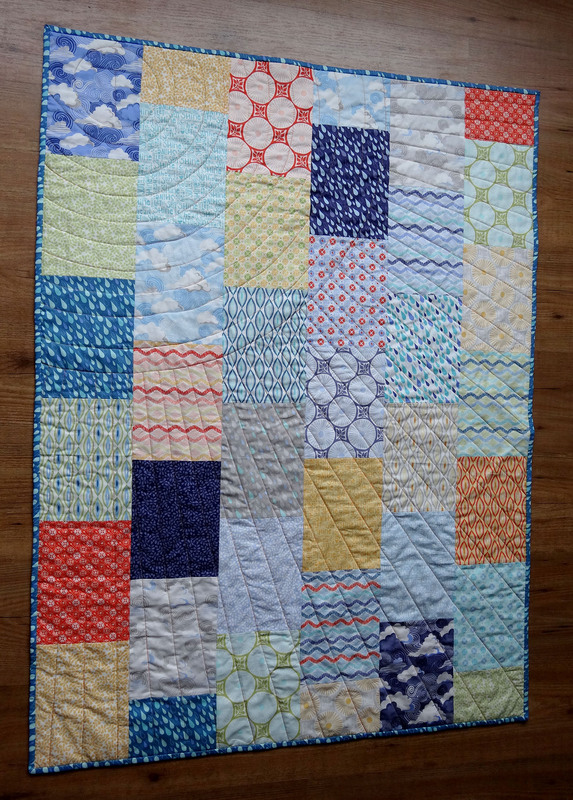 Your quilting looks amazing – do you mark the stitch lines before starting? If so, what do you use to do that? I am very inspired by your blog this evening – as you can probably tell, I started from the beginning and am reading through! You first popped up when I was searching for using binding on an armhole. Thank you! I marked the lines with a sew line mechanical pencil. These are ideal because they give a very narrow chalk line that is easy to follow. It’s available in different colours. I believe I started the first circle using a plate as a template and then measured the larger circles with a ruler. The sunrays were drawn with the aid of large quilting rulers.